But it can't be from Dolly Clackett. She gave me an Easter egg! : I guess what I'm saying is at some point, we've all parked in the wrong garage. I guess what I'm saying is at some point, we've all parked in the wrong garage. I've taken a break of a few days away from the internet. It's been really nice, actually. I was able to focus on getting some other things done and, when I came back to the land of the internets I found that the lovely Karen from Did You Make That? nominated me for a Beautiful Blogger award! This pretty much made my day, as did the very lovely write up she gave me. Her blog is one of my favourites and her sewing skills and sense of humour have inspired me in my sewing endeavours as well, so thank you Karen! Amber has talked before about her phone phobia, and I share this. When I was a teenager I used to spend hours and hours on the phone to my friend Emma (who I spent all day in school with) and my friend Miranda (who I never met) and that just seems unthinkable now. I mean, I love talking to people, but there is just something about the phone that I avoid. The absolute worst thing about my job is when the phone rings. I have a work blackberry and the sound of it ringing (or, of any blackberry ringing) is enough to bring me out in a cold sweat. I just can't explain it. My family always tease me when I go home about how English I sound. Now, I know that isn't true and that I definitely do not have an English accent. However, I know that in my nine years over here my accent and my intonation have changed. I partly blame teaching, I had to slow down and make myself a lot more clear for a classroom full of rowdy children. I can feel myself picking up the threads when I do go home, and maybe that's just the way it's going to be. I know I have never sounded just exactly as my family all do, even when I was living at home but still. I'm proud of my Northern Irish accent and I don't want to lose it! I was just never able to learn. I couldn't manage to float and I really hate having water on my face. I'm not too bothered about learning, either. I think even if I could swim I wouldn't bother with going to the swimming baths (chlorine and humidity - yuck!) Maybe I'd like to be able to swim in the sea, but I don't know. I think I'm unlikely to fall in the water and drown, but if I had children I would learn to swim, I suppose in case one of my children fell into the water. 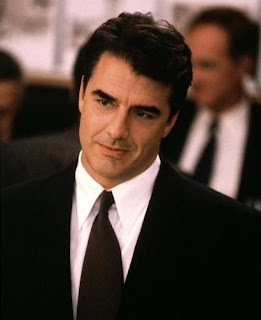 I think it's just that I love a man in a good suit! Okay, so maybe that one isn't little-known but I think it's worth saying anyway. I shave my legs, I wear dresses and high heels and make-up, and I am a feminist. I'm proud to say it. I'm stealing a bit from Karen, here. She mentioned chips. I love vegetables (just as well, as I am a vegetarian) but chips from the chip shop are my favourite treat. Potatoes in any form work for me, but I love chips. For a while I ate fish, and I don't any more, and occasionally I really some battered haddock along with my chips. I usually settle for lots of salt and vinegar and HP sauce. NOMS. I like to collect Hornsea pottery. There are only two of us living in our little flat but I have about 20 cups and mugs. I do drink a lot of tea, to be fair, but mainly I just have a weakness for nice tableware. Lovely Caroline. I discovered her blog quite by accident, and ended up finding a truly excellent friend. I got lucky that she lives in the area, and even luckier that she is so cool. Her blog is full of interesting posts on style, fashion, education...everything you can think of and more. Louise is another real-life friend. I love the way her sense of humour, and her fun attitude to life shine through in all of her posts. She's a vintage fiend, a marvellous photographer and an all-round star. Amber is awesome, and so are her blogs. She blogs for a living, but I'm linking here to her personal blog. It's full of humour and whimsy and her voice is inimitable, funny and engaging and smart. Mrs M is another local blogger. She's amazing on Twitter, as well. She writes recipes and reviews, and her blog is full of variety. She's funny and clever, and I always enjoy reading whatever she writes. Well, this one just reeks of nepotism because this is my lovely Nic's blog. I'm shameless, though. Also, his blog is excellent. He's only been blogging for a few months but his blog is excellent. He writes about mystery, movies, jazz and comics. I'm always full of pride and admiration when I read his writing, I think his blog is wonderful. Anyway...that's my Beautiful Blogger awards! 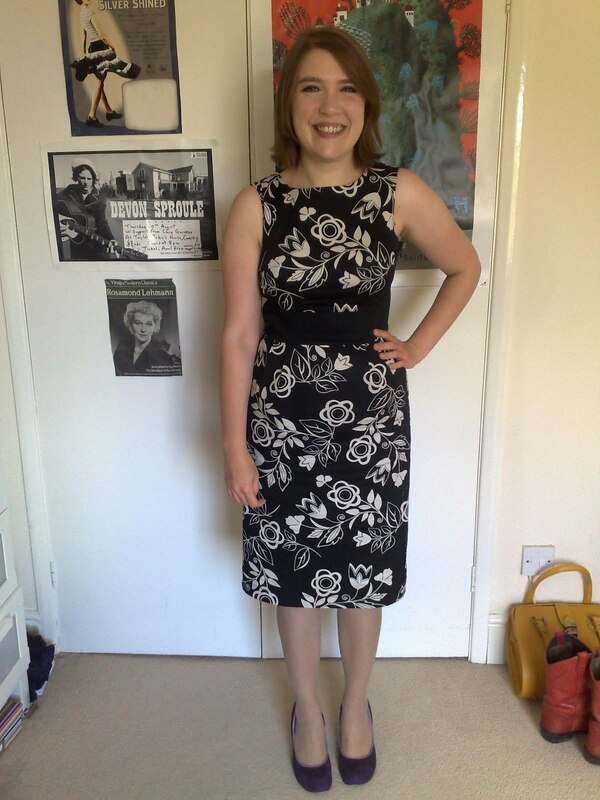 I love this dress, although I think the way the print falls on the bodice makes it difficult to photograph. This was another ebay find, a bargainous £7! It's a good vanity dress as well, because despite it being a size smaller than I usually wear it fits like it was made for me. I love the length of it and the pencil skirt, it also has the cutest little vent in the back. So, all in all £7 well spent I think! It doesn't photograph that well on the hanger and it needs a good iron, but it's a Macaron. It's another dress pattern from Colette Patterns. 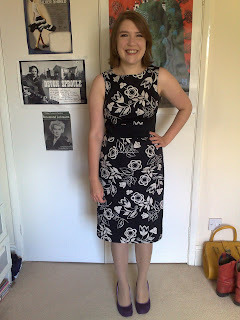 Again, this was a really enjoyable dress to sew up. I made a mistake initially with the pleats, and also I had to make the neckline wider because my head is just too big to get through the neckline as drafted on the pattern! Also I hope that the wider neckline won't mean that I cover the top of the dress with makeup when I take it off at night. The blue is really bright, brighter than I had initially planned but I like it all the same. 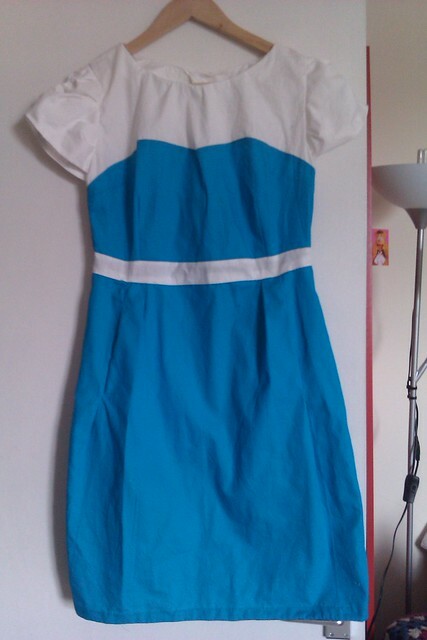 I'll sew this up in darker colours for the autumn as well, I think. And I'll post photos of me wearing this at some point over the weekend. Now, I think after all of that heavy thinking (!) it's time for me to have a cup of tea. Have a lovely Friday, everybody!